Sn-Sb alloy is the secondary resources of tin and antimony in metal recovery process and massively exist in the smelting and refining of crude tin. Vacuum distillation has many advantages such as high recovery efficiency, less pollution and easy operation in disposing of the Sn-Sb alloys. 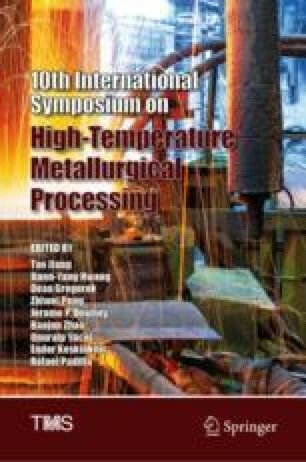 In this study, important factors of Sn-Sb alloy separation by vacuum distillation were researched, which includes distillation temperature, soaking time and feeding materials (thickness). The optimal experimental conditions of Sn-Sb alloy for vacuum distillation were determined. Under these conditions, temperature was 1474 K, soaking time was 45 min and feeding materials (thickness) were 125 g(0.8 cm), the content of Sn in liquid phase was 98.77%, and the content of Sb in gas phase was 98.77% and the direct yield of Sn was 96.01%. It was indicated that vacuum distillation is an effective method for Sn-Sb alloy separation and tin and antimony collection. This work was supported by the National Key Research and Development Program of China (2016YFC0400404), Joint Foundation of the NSFC-Yunnan Province (U1502271), the Cultivating Plan Program for the Leader in Science and Technology of the Yunnan Province (2014HA003), the Program for Nonferrous Metals Vacuum Metallurgy Innovation Team of Ministry of Science and Technology (2014RA4018), the Program for Innovative Research Team in University of Ministry of Education of China (IRT_17R48).